Zyrtec is a 1 year old skinny boar and has constant problems with his skin. I saw Zyrtec and his cage mate in a pet store and fell in love. Not the smartest thing I've done in my life. I got lucky with cage mate as he is a sturdy and healthy little guy. Zyrtec has not been so lucky. Since round april he has been constantly sick. If not eye issue (only left eye) then skin problems. He is currently on Vigamox for a S. Anginosus infection in this left eye and as soon as it clears up I am seeing an eye specialist that is supposed to be the best in town. That eye has been treated by three different vets, all very knowledgeable and trustworthy. I have no reason to doubt them, but the issue is clearly secondary so I will move forward. The bigger issue is Zyrtec's skin. He has been treated for mites multiple times (doesn't help), he has been treated for fungus topically, and orally (slight improvement after oral medication, but rather confounding factor i suspect). He has been tested for metabolic issues and liver function after the anti fungal treatment and all is normal. He is only on fleece in cage and no wooden items that can not be properly cleaned. He gets fatty acids with meals in an attempt to hydrate skin (p.o). He dislikes (no irritation of skin, he is just a grumpy boy) Gorgeous guinea calendula, neem soothing gel or regular coconut oil. Neither helps more than temporarily. The skin is not thick or crusty, but rather dry and sensitive. He does have a small fit if he scratches intensely. The BIG issue is.. When he is at the pet hotel (like now over xmas) he comes back with decent skin! Few days at home and his problem is back. I provide everything for the hotel. Cage, dry food, veggies, fleece, hay, toilet substrate, medication. Is your house particularly dry? And how often do you oil his skin? As I understand it, the oil needs to be applied regularly. But i question that the mites treatments don't work. What medication are you using? What is the strength? What is the dose? How often do you apply it? I will get a hygrometer to check, but can't say that I notice it being dry. I moisturise his skin once a day (the hotel doesn't at all), sometimes every second day. I have been reluctant to do it more often as he is bothered by it. He has been treated with Ivermectin at the vet(vetamectin 1% 0,2ml, topical). The last treatment batch was 3 doses in total, ca 10-14 days apart. I have since gotten a new vet that specialise in dermatology that prefers Selamectin, but she sees no indication to treat for mites at this point. She has noted that he has a poor immune system. He does get better at times, but mostly only for a few weeks and then it comes back and it's mainly unrelated to time of treatments for mites or fungus. Check what bedding the hotel is using. You can probably find out what the humidity levels are if you visit with a temp/humidity gauge and compare your apartment. Were both guinea pigs treated for mites? One can be a carrier. Consider even the detergent you use if you are using fleece. Try the same bedding as the hotel. There are lots of things to rule out. Avoid the Neem oil. The hotel is only using my fleece and bath mats that I provide them with so that's a static factor. I noticed that they do use scented detergent, whereas I have tried 2 different brands of unscented, one of them being baby detergent. The cage mate was treated previous times, but not this last round. I have to add that he is much better than in august which was when the pic was taken. He has no scratches in skin or bleeding, but he is not symptom free. Could you have some kind of fungus in your house that is continuously reinfecting him? It might be a long shot, but I have this problem with staph (me, not my piggies) where it immediately goes away whenever I"m away from home for more than a couple days, and comes back after a night at home. If you've treated him repeatedly with the same antifungal, the fungus could develop resistance. I don't know if this can happen in guinea pigs, but it was the first thing I thought of because of my staph. It's probably not likely, though. With mites, you have to treat a minimum of two (better if three or more) times to ensure you kill the eggs. If the other guinea pig was only treated once, it could still be a carrier. Sounds like the fleece is being ruled out as an irritant. The other was treated twice before (each treatment consisted of 3 doses), just not this last time in august. I'm not sure it actually is mites as he gets better after one week away at the hotel (and at random times at home). They go with all their stuff and together to the hotel as well. I have noticed that his skin is better just after the short trip to the vet due to something I could only compare to sweating. I know it sounds ridiculous. His skin always looks great when I pick him up, but he is clearly not all that happy there as he loses a bit of weight that he quickly regains (I only house them there when absolutely necessary). I have considered fungus at home. I can't see any signs of growth, no humid places or any respiratory problems myself, but I am keeping it in mind. He only had topical fungal treatment that just made his skin worse and oral treatment this autumn that worked as much as placebo in addition to being hell to administer. He clearly is more sensitive than normal so I will increase moisturisation with calendula lotion and check humidity. The odd thing is that it has been fluctuating since spring, so it has been independent of summer heat and winters cold. Let us know what the humidity levels are when you get a reading at home and at the hotel. Have you also tried some sort of oil that doesn't have anything in it? He may be allergic to herbal preparations in the oils. Everything has been closed yesterday and today but I will get a reader and visit the hotel tmrw and let you know. I mainly used pure coconut oil before (spring and summer), it made him look real nice but didn't help with his level of discomfort. It is only on neck behind shoulder blades that is irritated by touch, which I always felt were consistent with mites (?). Maybe if readings are normal I should consider treating with Selamectin in case it is due to ivermectin resistant mites. What are your thoughts on that? Selamectin is just a variation of ivermectin. If ivermectin didn't work, selamectin likely won't either. Were all the pigs treated three or four times, seven days apart? It takes that many treatments to hit all phases of the mites' life cycle. Yes, I know that it is a different compound. I was just thinking as it presents similar to mites, and ivermectin does nothing except irritates his skin further, that going different anti parasitic could be a worth a try in the future. They were both treated 3x 7 days apart during spring and summer. i.e 2x this year. Zyrtec was then treated again this autumn (more days apart) while getting anti fungal treatment and immune stimulating drug. 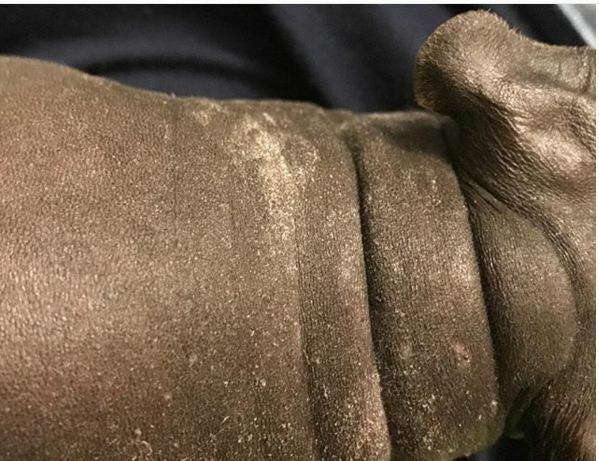 His skin looks like any normal skinny pig at the moment, but touching or moisturising the area results in loud complaints and is followed by scratching with screams a couple of times during the day. If I don't moisturise he scratches less (if at all some days), but then starts again when skin gets dry 2-3 days later. It doesn't matter what I use to moisturise (I stick to same product minimum 2 weeks). Has the vet prescribed a steroid cream? That might reduce the itching. What strength of ivermectin did you use? And how much of it? We've had one person do repeated, failed treatment with ivermectin because she used an insulin syringe, not realizing that the markings are different. Once she got the right dosage, the mites went away. Trying the selamectin actually could help if there is an issue with the ivermectin. Personally, I am an ivermectin fan (widely available and reasonable in cost) but in the years I have been reading posts, a couple people have claimed better results with the selamectin. I read the Pink Rufus post some time ago and I still find it brilliant. I was at the hotel today and measured just round 30% RH and at my place it is 27% RH. It isn't a significant difference but clearly too dry so I am addressing that to start with. The boys without doubt got the right dose of ivermectin, rather on the high range for their weight actually (Zyrtec was just over 700g until recently when he increased to almost 800g). We have discussed using a steroid cream if the current treatment with fatty acids and external moisturising wouldn't improve the issue. He IS in better condition than in a long time atm, but the root of the problem (whatever it is) is still there. He is a small guy, poor immune system, and with chronic left eye problems (we are going to an ophthalmologist on monday) and I suspect that he is suffering from the consequences of reckless breeding. If you haven't already, quiz the hotel staff to see if they have any ideas of what might be different. I talked to the vet there (the staff doesn't speak english) and she didn't have any theories especially since she never seen him particularly bad. I am working hard on getting the humidity up. It is surprisingly difficult actually! Im at 35% atm. He hasn't been itchy at all today but it is early to say. I really hope it was as easy as this! Never thought issue with humidity would give such major complications as I've seen in Zyrtec. I will update the thread with info on his eye problem as soon as I find something out. I spoke too soon. It is def not the humidity.. He is itchy like hell today. For no apparent reason.